I grew up in the 80's, so the GI Joes that I had as a kid were from the 3 ¾" line. My father had a couple of 12" ones and a box of accessories, which he regrettably sold for $5.00. 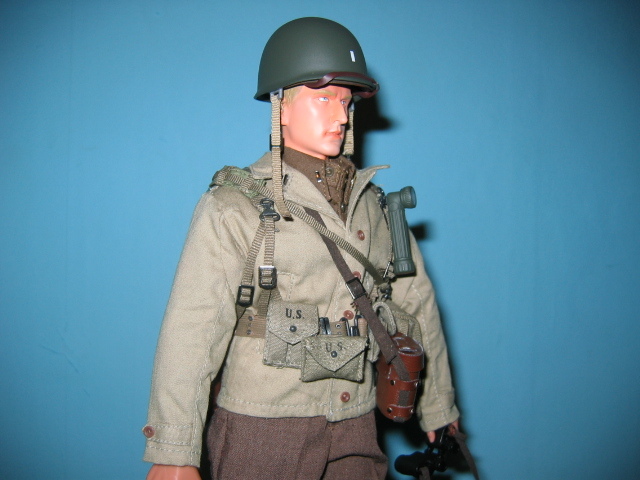 My first 1/6th scale figures were from 21st Century Toys' WWII Ultimate Soldier line. I bought two of them, but quickly lost interest due to the release of their 32X line. My interest was rekindled when my father came home with a group of 12" generic GI Joes that he had bought at a lawn sale during the spring of 2006. I then began to look online to see what was going on in the world of 1/6 scale figures. At first, I was going to start collecting from the Ultimate Soldier line again, but I decided to go with Dragon's line since they have better detail and a wider variety. Overall, I'm very pleased with Dragon's figures. My only complaint is that it's difficult to obtain the American figures that I'm interested in. I still can't get James "Jim" Gordon because auctions for them are scarce and when they do turn up; they go for astronomical prices. 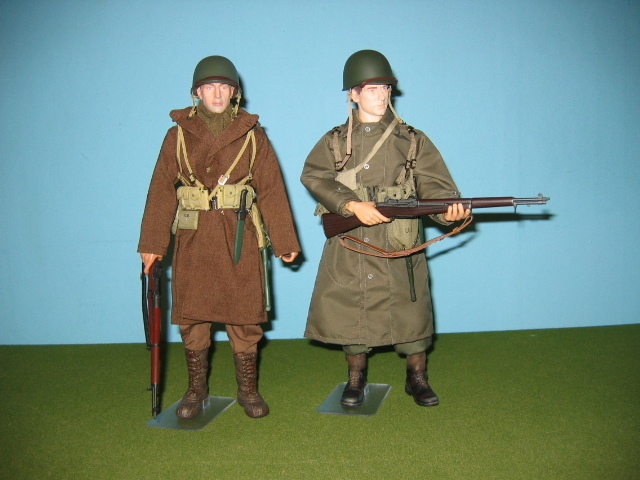 Two of my favorite allied figures in my collection: Private "Hank Louis" 30th Infantry Division ST. Vith 1945 and Private "Cory Walker" 27th Armored Infantry Battalion Remagen 1945. I had a hard time obtaining Cory Walker of off eBay, but I lucked out when a seller ran a Dutch auction for five of them Buy It Now. A funny thing about that particular figure is that it's raincoat smells like an army surplus rain tarp that my father had kicking around in our attic. 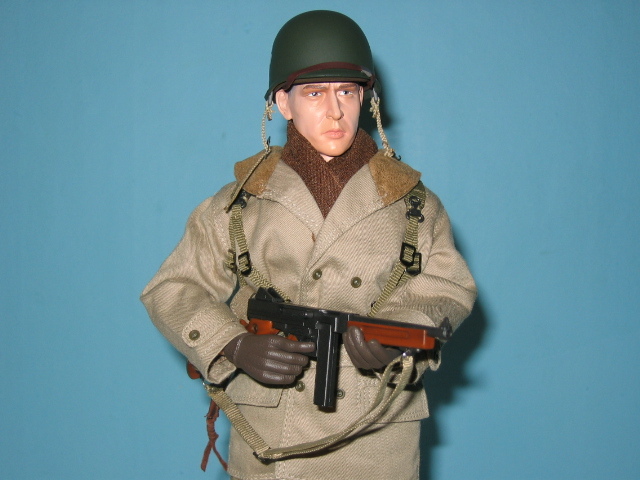 A close-up of one of my favorite allied figures in my collection: Platoon Leader (First Lieutenant) "Morris Craig" 9th Infantry Division France 1944. This figure took me a longtime to obtain. A close-up of another one of my favorite allied figures in my collection: Staff Sergeant "Tab" 101st Airborne NCO 327th Glider Infantry Regiment Bastogne 1944. This figure took me an even longer time to obtain. 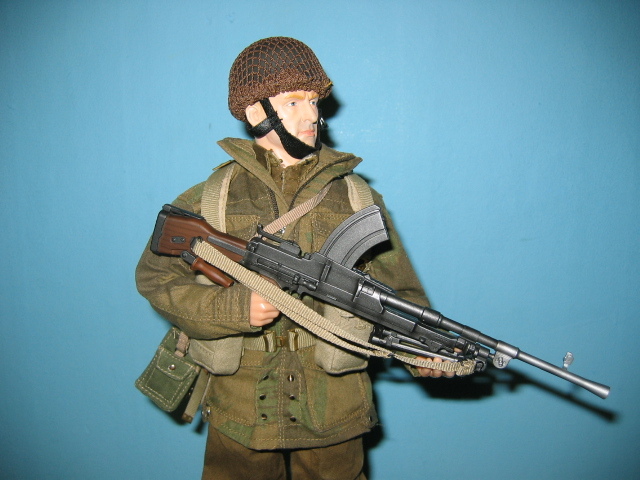 A close-up of yet another one of my favorite allied figures in my collection: Soldat 003 Private Harry Collins 1st Airborne Division 2nd Para Battalion "Operation Market-Garden" Arnhem 1944. 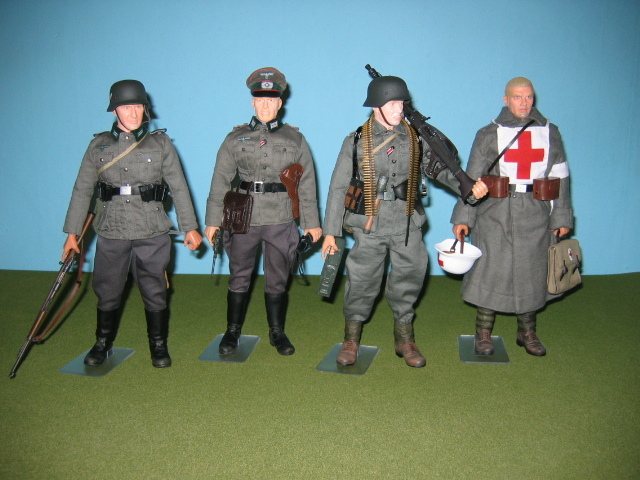 Four of my favorite axis figures in my collection: Soldat 001 Wehrmacht-Heer Schutze "Peter Schmidt", Oberleutnant "Manfred Hecht" Artillerie-Regiment 4 France 1940, Soldat 004b Wehrmacht-Heer Gefreiter "Willisch Biest" Panzergrenadier-Regiment 7 Zhitomir 1943, and Sanitatsgefreiter "Eugen" 116 . Panzer-Division Aachen 1944. Eugen was the first Dragon figure that I purchased. These little guys are from Dragon's Action Figure Minis line and are based on some of their early 1/6 scale figures. They came out back in 2000 and are pretty hard to come by nowadays. 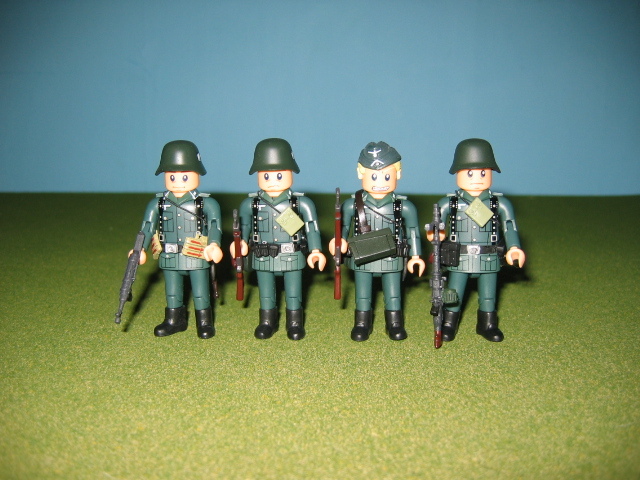 Pictured left to right: Wehrmacht "Hans", "Klaus", "Heinrich", and "Erich" Barbarossa 1941.